In a world of Snapchat: Send; disappear; repeat … films can be an intellectual antidote. 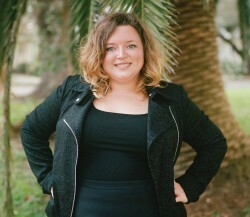 Fallon Young, the new executive director of the New Orleans Film Society, believes deeply in the value of seeing work in a theater, building community in the company of friends and strangers, and learning through the dialogue that comes out of such a shared experience. She also believes in film’s growth and permanence. Young replaces Jolene Pinder, who stepped down from the lead NOFS role at the end of 2016 after six years at the helm. Young’s hiring marks her return to the city after an enlightening stint as interim executive director and director of communications and community engagement at San Francisco’s SOMArts Cultural Center. SOMArts fosters access to the arts as well as artist-community collaboration in the Bay Area. Young feels strongly her work there seeking strategic partnerships and shared resources will translate well in her new position, and the board was attracted by her commitment to developing and supporting artistic communities. Young’s first big objective is a successful first NOFS event — the annual French Film Festival, April 21-27 at the Prytania Theatre. Beyond that, the Society presents year-round film programming that includes the annual New Orleans Film Festival, and other screenings and special events designed to benefit local film audiences, artists (especially the under-represented) and professionals. Young grew up in East Texas but honed her culinary and Cajun cultural chops through constant visits to family in Eunice, La. After college at the University of Texas, she sharpened her sensibilities through more than nine years in the Bay Area, including her first visit to San Francisco’s Frameline LGBTQ Film Festival. Now Young is excited to be back in what she calls “a thriving epicenter of creativity and culture,” and proud to be a first-time homeowner in the Seventh Ward and ecstatic at the opportunity to lead NOFS. 1. The Society is now 27 years old. 2. It’s Film Festival, held annually in October, is now Academy-accredited and Oscar-qualifying in three categories: Narrative Short; Documentary Short; and Animated Short. 3. NOFS is the host of Emerging Voices, an annual initiative to create a more diverse storytelling landscape by giving filmmakers of color in Louisiana greater access to gatekeepers. Selected filmmakers are paired with a film industry leader who acts as a mentor through one-on-one meetings and short intensive meetings with other industry professionals during the NOFF Industry Exchange to pitch their projects and build further connections. 4. The Society launched Create Louisiana Filmmakers Grant Program two years ago with key partners Deep South Studios and the Louisiana Endowment for the Humanities. In its first year, it awarded a $50,000 grant to locals Nailah Jefferson and Jon Wood to make the short narrative film Plaquemines. 5. Cinema Classroom is an annual program that expands young students’ exposure to film. Students in schools around the city receive the tools to engage critically with visual media and have the opportunity to meet working filmmakers.